Farrington has developed an amateur-built kit gyrocopter with some features of the Umbaugh U-18 known as the Farrington "Twinstar". 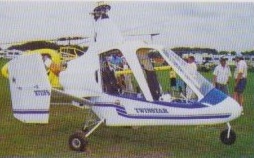 This has an open fibreglass cockpit shell, a large twin-fin tail unit and a main rotor mounted on a tubular steel pylon. It is powered by a 110kW Lycoming 0-320 and the first prototype first flew in 1991. 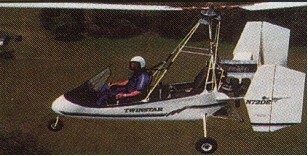 A two seat tandem, enclosed autogyro with a pre-welded (tig) tube structure and full dual controls. Engine: Lycoming O-320, 150 hp.